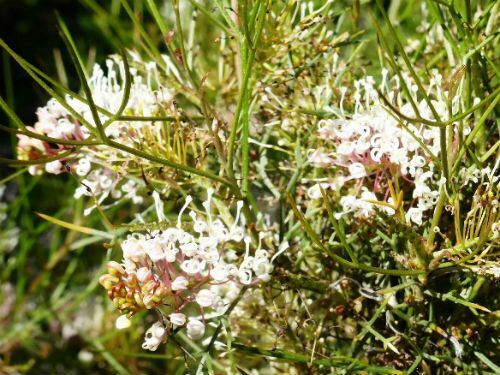 Grevillea teretifolia is an erect, medium shrub with light green, segmented leaves. Each segment is crowned with a sharp point. Flowers are carried in pendulous, one-sided clusters, white, sometimes pink and appear in profusion during spring. Light pruning, after flowering, is appreciated. Honeyeaters are attracted to the flowers. Specimens, in our cold climate garden, have proved to be extremely tolerant of drought and frost. Grevillea teretifolia could be grown as a screen, hedge or for controlling foot traffic. Grevillea teretifolia occurs in the south west corner of Western Australia. The type specimen was collected by James Drummond, in the mid 1800’s, in the vicinity of the Swan River, Western Australia.